We could see the ground! Just a few floors down and we’d be out! Next we looked through a window, we learned: amidst the permeating insanity, signs are your only friend. But then came the communication issues. I built some shelves. Now I can neatly tuck in all the comics. ... except, there’s not enough room! I need more shelves! Meanwhile, you can borrow some of the ones that didn’t fit. 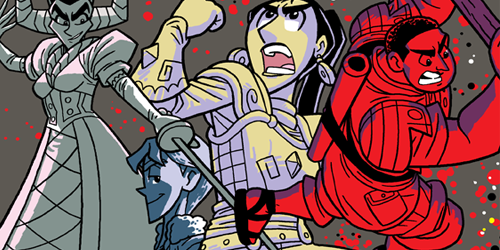 Monster Lands by J. Nelson – Monster Lands is a fantasy/dramedy story that focuses on the axe-wielding, monster-riding adventurer Othera as she battles against the tyranny of the evil queen Eren Lorry! It’s largely a character-driven story, written as sort of a deconstruction of fantasy tropes while also being a love letter to the genre. It is made of numerous short, standalone chapters which form the base for the longer, plot-intensive chapters. 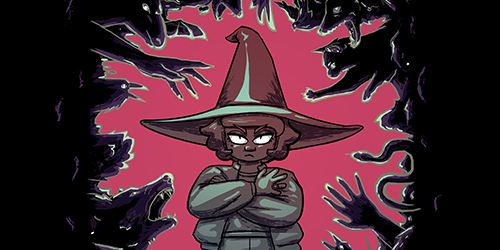 Evil Witch Allie by Kristin Tipping – A comic about some average kids dealing with normal teen problems like babysitting the world's worst magical girl, solving yet another murder, and getting that darn ghost cat to stop sleeping on the keyboard. 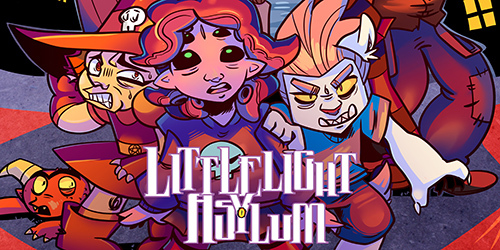 LittleLight Asylum by Julian Dominguez – In a strange orphanage where the little monsters really are little monsters, three friends are constantly getting themselves into supernatural misadventures.